quick update on TDE2012. cruizing around alicante and creating quite a stir anywhere we go. 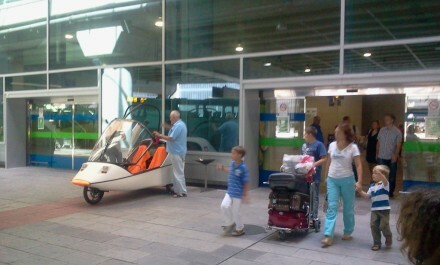 then my family arrives and we head out to the airport to pick them up > one of our daughters will certainly want to drive back to the apartment with the TWIKE! JC & I have been planning the next leg of TDE2012 > a map with the exact route will be posted here shortly. jc is staying until thursday and then will head up north towards the atlantic. the GPS tracker will be active, so the global positioning page and location badge on the first page will be accurate during the next few weeks. i’m looking forward to relaxing at the beach and planning our next adventure end of september or beginning of october 12 – more to follow.